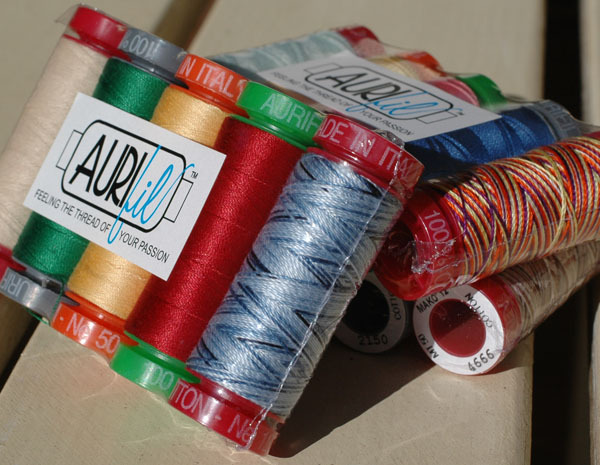 It is time for another Aurifil giveaway! Three lucky people will be sent an assortment of Aurifil threads to play with! To enter, just leave me a comment on this post telling me whether you prefer to buy 10'' squares, roll-ups (2-1/2'' strips), or fat quarters. Do you have a favorite? Please become a follower if you aren't already. Only one entry per person please. Deadline is this Monday, February 20th, at midnight. Fat quarters for me, please! Altho it costs much less to get strips or squares, they aren't as versatile. Fat quarters - I feel like I have more options then for smaller projects like bags, pillows or swap blocks. Thanks for the chance to win! I haven't tried Aurifil yet, but I know lots of quilters who rave about it. I find that fat quarters are more versitile and usually my first choice of precuts. I have recently purchased a jelly roll of batiks for a more affordable way to get scrappy into a qult. I've also purchased a few 10" square packs, but have not put them to use. Still trying to figure out what pattern to use. I love FQ's, but bought roll ups and charm packs too. I think FQ's give me more possibilities. Thanks for a chance to win this great threat. I'm a follower and I prefer fat quarters. Thanks for the giveaway! I am a follower...from the choices; I prefere fat quarters. But generally buy by the meter or the bolt. thanks for this great giveaway. I am a fat quarter girl. Although I do have a lot of 10" squares and 5" squares and rollups. Yikes! I dunno...lately it's been FQs though. I'm your follower, since my real choice's a full yard isn't there, then I'll say fat quarters! I like fat quarters because my options are better. I'm a follower, and I'd pick layer cake. I have some fat quarters but haven't done a thing with them. I need to be more creative! I have been buying 2.5 inch jelly rolls lately because I found several fun patterns you can do with them. They also sew up quickly. I like charm packs and jelly rolls. Most of the cutting is already done for you! I like the convenience of roll up's and charm packs, but the more I get into quilting, the more I appreciate fat quarters and the infinate possibilities they offer. Fat quarters for me. I always admire the charm packs, etc., but invariably buy fat quarters. More versatility. I love to use layer cakes and charm packs. I am a follower of your interesting blog. Thanks for offering the giveaway. Depends on the project, seems as I have been using the roll-ups lately. I love all of them, including yardage. I prefer fat quarters. However, I'm not picky when it comes to fabric. I'm a follower through Google Reader. It would have to be FQs. You can do almost anything with them. Fat quarters....so much more possibility! :) I do enjoy buying charms too in order to get a sample of an entire collection. I prefer FQs...sometimes I will collect charm packs.. I prefer FQ's - they are versatile and perfect for the projects that I love to make... lap quilts, table toppers, placemats, wall hangings etc. FQs for me! more stuff to work with! Hello Amanda! Love using all pre-cuts-but I think fat quarters are my favorite, for their varied uses! Thanks so for sharing! I prefer fat quarters or half yards so I have to option to cut out a specific part of the design. Layer cakes, followed by yardage if I love it. Usually fat quarters but it depends on what I can find in what I want. I prefer fat quarters but my purse prefers charms!! Hi! I'm a follower. I would say FQ as they are versatile to use. I've never bought 10" squares but would like to take a chance but think I might have leftovers that I won't be able to use. Thanks for the chance to win the giveaway! My favorites are half-yard bundles (someone else picks out the colors & I have enough to really play)! Fat quarters for me, and lots of them to mix and match. Thanks for the chance to try and play with the threads. I am a follower and I love to buy FQ's! Thanks for the give away! I like FQs for the versatility, but I haven't really given pre-cuts a good chance. I just started buying some recently so maybe my preference will change. I try to work with all different pre-cuts. Fat quaters are my favorite but I have a selection of Jelly rolls, turnovers and other pre cuts in my sewing room all the time. I am already a follower. I love fat quarters, but usually I cannot afford to buy an entire line in FQs, so I gravitate toward layer cakes. It's a toss up between fat quarters and layer cakes for me. I like the 10". Pick a favorite, are you kidding? Right now it is etchings, blueberry crumble, 1934, ow,la,la, and oh all of them! Is it fair to say thay I love them all! I would love to try this thread. My LQS doesn't carry it. I'm pretty much only into fat quarters. I think I prefer fat quarters, but to be fair, I haven't purchased the other kinds of pre-cuts yet. I do have charm packs, but I still like fat quarters better. and I love auriful 50wt. It's great! It really depends what I am wanting to do. But I am leaning towards FQs and I also like Charm packs. Mmm...fat quarters :) but 1/2 yard is better. Thanks for the chance! I'm a fat quarter girl! Love Aurifil. Thanks for a chance. I love FQ and jelly rolls. Thanks for the chance to win some Aurifil Thread. Love fat quarters but sometimes the roll ups are just perfect. (I have a book that I have been meaning to dig into and did a few projects with strips so far.) Thanks for doing this. I tend towards jelly rolls, I don't know why I even have several books and patterns but have yet to make a dent in my collection. When buying pre-cuts I generally go for FQs over the others, but I really like yardage. I love all three but usually buy fat quarters. Thanks for the chance to win..would love to try Aurifil threads. Fat quarters for me please! There ar so many patterns that call for the use of these now. I love them! I would prefer fat quarters. Jelly rolls would be my last choice. I prefer Layer Cakes, Jelly Rolls and Charm packs (gosh I have got to stop calling these things cupcakes in my brain). Sorry I couldn't pick just one because I love them equally - like my children. I am already a follower. I like them all! I guess my favorite would depend on what I want to use them for! I usually buy yardage but I do purchase fat quarters. I have more quilts made from charm squares, but love Jelly Rolls. I have lots of FQs but don't use them as often. I guess my answer would be 2 1/2" strips. Thanks! Mostly yardage and fat quarters. Sometimes the strips to make bowls. Thanks for the giveaway. Thank you for a chance in a great giveaway! I love fat quarters or better yet a whole yard to keep some in the stash and use some! Over the years I've bought mostly yardage and FQs when they are on sale. Thanks for this. I like the Fat Quarters as I can cut bigger projects out of them! They work really nice for purse making? And I love your thread. Thank you for your contest! I would prefer to buy (win) the 2 1/2 inch roll-ups - less cutting! Thanks for the chance to win and have a Happy Weekend! I prefer the 2 1/2 in strips although I've found myself purchasing more and more FQs. Decisions decisions! Love FQ´s! Specially scrap bags with a lot of different FQ´s! I buy all the cuts but I prefer to have a full yard unless I really like it then it's two yards! Thanks for the opportunity to win this beautiful thread. Fat quarters - they're the most flexible. Definitely fat quarters are my favorite. Their versatility encompasses and fulfills my entertainment in making scrap quilts. The more, the better! I guess I'd say FQ's....like the other comments, it gives me a variety of ways to cut them. However, I do love all of the pre-cuts, especially all of the patterns specifically designed for pre-cuts. The thread is beautiful and such a great giveaway. It's yardage for me! I started out with fat quarters, but soon discovered that I was always wanting more than what the fat quarter had to give. I've normally just used fat quarters but have branched out to 10" squares and bought an AccuQuilt GO! so know that strip piecing is coming online soon. I think that fat quarters give you the most flexibility. I like the 2.5 inch strips best as they can be used for bargello quilts - thats for the great giveaway! I love the versatility of fat quarters. Amazing what you can do with that one wee rectangle. The pre cuts are convient but more expensive. Im on a budget so buy yardage when on sale. One more hobby that has become a status for the rich. Love nice thread too but not for $10 a spool. A give away would be great as I usually buy the budget from the chain stores. I usually buy fat quaters. I am an new follower. I love the squares. I can cut them in triangles, rectangles, or small block sizes. So versatile! I like 10" squares for quilting, but I'd get fat quarters if I want to make small projects. Thanks for the chance! I'm a new follower. I prefer to buy yardage, followed by fat quarters. I usually like FQs the best! I've been a follower of your blog for a while, love it! Thanks so much for the giveaway! Hi I am a new follower!!! I like FQ but in all honesty they all work for me, you can do so many things either way they are cut and never run out of ideas!!! Thank you for the fun contest! I would normally sat FQS but I have found a new love with the 2 1/2" strips. I have made some amazing quilts with them. If I have the money, I buy fat quarter bundles, second would be layer cakes, third jelly rolls. Fat quarters, i think they are more versatile and I love piecing! Layer cakes are my current favorite, but I think that's mostly because they're cheaper to buy than a fat quarter bundle when I want the whole line. More is good, so I will choose fat quarters! Well if my budget would allow it would be Fat Quarters but since it rarely does allow for that I would choose Layer Cakes. I have used several roll-ups and charm squares. Have not yet used any of the 10" squares that I have purchased. I prefer roll-ups. I prefer fat quarters, because I actually really enjoy cutting fabric. :) I would love to give jelly rolls a try though. Thanks for the chance to win! The squares,I tend to loose them,jelly rolls I need a certain pattern,have bought some ,now the fat1/4s I love... I'm a fuser so I fuse my fat 1/4s ,I don't loose them ,and I don't need a certain pattern,,, just the way I am !!! I prefer the rolled up strips of the choices we have. Really like the charm packets. I buy FQ's - every birthday, every doctor's visit - every time I pass a Quilt Shop!! Fat quarters as they can always be cut smaller. Occasionally 10" squares if I want an assortment of the same fabric line. I prefer FQ's mostly because I'm not as accurate as I should be and I feel more comfortable having a little mistake wiggle room. Thanks. If I have to choose from your list, fat quarters. I usually buy 1 yd pieces though. Seems I'll pick a fat quarter I like for the border every time! I usually buy fat quarters so I an use them for small projects. I like FQs, but if there is a particular collection I like I will often buy roll-ups as I like scrappy quilts and it shows off the collection well. Love layer cakes as there is so many things you can do with them. Love to win the threads! I tend to buy fat quarters mostly. Thanks for the great giveaway. I'm a follower too! I'm a new quilter, and at the moment I have only tried fat quarters, but iverecently been looking at jelly rolls and wondering wether to try that next. I but fat quarters, though I do like Jelly rolls for quick baby quilts. I am a followers. Thank you for having this give away. Of the choices you have listed, I prefer fat quarters. In reality, I prefer 1/4 yard cuts and larger. I am a follower. I love fat quarters because I can get a good assortment and variety of colors and designs and not tie up a lot of money! I love fat quarters but if that's out of my budget I will sometimes buy a layer cake if I adore the line! By the way, I am a big fan of Aurifil thread for piecing - nice seams and almost no lint. I would like 10", layer cake. I cut them all the time for charity quilts, this would give me a break. I have never tried the Aurifil thread so I'm keeping my fingers crossed! I'm a happy follower and I love using all the above! Mostly FQ's though because you have enough fabric to change your mind or make a mistake. ;-) Have a happy weekend! I prefer FQ's. You can make more with them. I love them all! I really love charm packs, because you can do so much with them, but you definitely have to buy more than one! LOL! I perfer to buy Fat quarters myself, they seem cheaper and sometimes you dont need a whole yard or more to do a project so you dont waste alot of fabric. I lOVE fat quarters and collecting them! I do purchase layer cakes and jelly rolls but most of my purchases are fat quarters! Thanks for the giveaway! I prefer fq's just in cast there is a mistake made in cutting and I have never used a roll strip. I love the look and the feel of the aurifil thread has on the fabric. I prefer fat quarters. There's actually a lot of usable fabric in an 18x22" piece! If I buy them on sale they're economical as well. Thank you for the chance to win some Aurifil! I prefer Fat Quarters just because I know I have a reasonable amount of material to work with in case I should have an oops. Jelly rolls are growing on me though. Thank you for the giveaway!! Fat quarter though I have started bying jelly rolls and charm pack. Thanks for the chance to win some Aurifil! While I love the precut strips, I will usually purchase fat quarters due to their versatility. Of course, fabrics I love are bought by the yard, since a fat quarter would never be enough. My choice is FQs, unless I have a specific idea and know that I need the others. Thanks for the chance to win! I like to by at least a fat quarter! Thanks for the chance to win! Do u really have to choose just one !I love using them all in different ways , but if i really had to choose just one I guess it would have to be the Jelly Rolls , as I can usually whip up a quilt easily enough with just them . I prefer fat quarters. Much more useful in all kinds of things, even pillows that my kids are into making now. I think I now prefer jelly rolls. Have quite a collection of fat quarters and charm packs but the jelly rolls are very versatile. I prefer to use FQ's although I have done some interesting pieces using the roll-ups. I'm a follower & a FQ kind of girl ... Thanks! Am a follower, and usually I love fat quarters, but lately I'm obsessed with 2.5" strips! I reallly enjoy your blog. Thank you for a chance to win something useful. I love fat quarters best. I am now a follower of your blog. Of the options you have given I would rather have Fat Quarters. I like to use them in a project and have a wee bit left over to use later. However recently I have been stocking up on long quarters or half metres since I find them more useful. It must be an old habit, but I still buy FAT quarters. They are more versatile. have more uses for fat quarters, but like layer cakes just about as much, and i like aurifil even better. thanx for the opportunity to win some. All the pre-cuts are so tempting, but the best, I think, is fat quarters. Thanks for the giveaway! I am new to quilting and pre-cut fabrics. So far, I've only used charm packs. I would like to try fat quarters sometime when my budget allows. Thanks for the chance at your giveaway. I like to buy fat quarters, gives me enough to make something small or mix in to make something bigger. I'm a follower and I prefer fat quarters! Thanks! I am a follower. Thanks for the great giveaway. Size wise I prefer fat quarters, but if I want an entire collection I buy a layer cake. If the money is there, I prefer to purchase fat quarters. If I only have a little cash, then I'll order charm pack just so I have some of that certain fabric line. Although I prefer larger cuts, I would have to defer to the fat quarters. I would only use the other cuts for a specific project. Thank you for the giveaway! I'm a fat quarter girl. Matter of fact, I have very little of other sizes although charm packs and layer cakes do give you a piece of each one in the line. I'd love to try some Aurifil. Out of those three, I would have to say fat quarters. I do like the layer cakes from Moda also. Just started following your site. I just love aurifil!! Thanks for the great giveaway! I prefer fat quarters because you have a lot more fabric to work with. When I'm not able to find the colors I want, I'd definitely use a layer cake, charm pack or jelly roll. They all are great for a quick quilting project. I usually buy larger cuts of fabric but when I buy smaller cuts, I will buy FQ's.I really love FQ's because there is more fabric to play with. I would really LOVE to win this thread. I have never had a chance to use it and I would like to give it a try. I have heard so much about it. Thanks for the chance to win it. Sorry. Anonymous above is me and I forget to leave my name and email. Joyce--ccarter13@windstream.net. Thank you. I've bought fat quarters mostly, but I like the idea of the 10 inch squares. Thanks the giveaway. I prefer fat quarters. They are much more versatile. I just started following Aurifil this week on FB. I have subscribed to your blog via RSS Feed. Fat quarters are my precut of choice. I love all three. Can use any of them in so many ways. of those 3 i would take the fat quarter, because of the versatility. i like the jelly rolls too. i have never bought a layer cake yet. most of the time i get half yards for blocks. i love scrappy and controlled scrappy quilts. I have LOTS of fat quarters, but I'm starting to buy other precuts. Not long ago, I bought some batik strips. I can't wait to sew them together. Knowing that some of the cutting has been done is motivating. The Jelly Rolls are my first pick, they the layer cakes. I've found that I only buy fats when I have a project in mind. Of the choices listed, I buy more fat quarters, but what I really buy is yardage. Ester Forrest posted about this giveway in Quilts of Many Angels..they could really use this thread for their charity quilts. Although I love fat quarters I love the 10" squares as they are a cheaper way to buy a complete set of fabrics. BUT... I prefer fat quarters as they are more versatile but I can't afford much fabric so I like precuts. I am a follower. I don't really have a favorite - have used them all. Generally, it depends on the project. I made a box where you covered cotton rope in fabric and the jelly roll was perfect and much faster. Like many of the people responding here: I love fat quarters, but usually, if I'm buying and don't have a purpose in mind, I will buy more: at least a half or even full yard. I bought a charm pack once and used it for a paper-pieced project with a lot of variation. I've never bought a jelly roll, but I am constantly cutting 2 1/2" strips. I am a pre-washer and presser of all fabric, so that is probably why I don't use a lot of pre-cuts. Am a follower...I think that fat quarters and 10in squares are my favorites...more versatile. Love aurafil too...low lint! Thanks for the chance to win! Of those three, I would go with fat quarters. I am already a follower of your blog. I get whatever I see that I like. I have enough patterns that finding a project for them shouldn't be a problem. If I have to pick one, I'd go with FQs. I love getting fat quarters, but jelly rolls are a close 2nd. I'm already a follower :) Thanks for the chance to win! While I enjoy all types of precuts from time to time, fat quarters are the most versatile. I usually treat myself to at least one when I go o the quilt shop! I would probably say fat quarters because they are the most versatile. At the moment I'm working with a couple of layer cakes. I like the variety of prints in these packs. I'm more of a fat quarter kind of gal, but I'm new to quilting and haven't tried out all the pre-cuts. I have to stop myself from buying charm packs though. I find them very enticing.